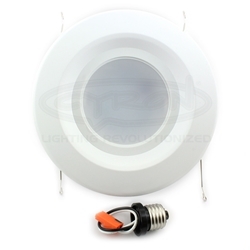 Cyron BDL6B1-D01-15 recess downlight is adjustable to fit 5" and 6" ceiling cans. Color Rendering Index of 90+ offers the best representation of colors. 15W power draw will replace a 100W conventional bulb. Dimmable down to approximately 10% with electronic LED type dimmers. UL and energy star listed. Available in 3 tones of white. White trim. Sealed trim with gasket for better insulation which saves on air conditioning usages. *based on 3hours per day average use.